The Korea Forest Service on Wednesday signed a memorandum of understanding with Cambodia to prevent deforestation and degradation in the Southeast Asian country, government officials said Thursday. Under the MOU, the two countries will cooperate on United Nations-led REDD+ programs ― standing for Reducing Emissions from Deforestation and Forest Degradation ― that aim to cut greenhouse gas emissions by preventing forest degradation and deforestation in developing countries. “Cambodia has a big presence among the REDD+ countries. Cambodia’s experience and our business know-how from Indonesian projects will help us gain certified emission reduction credits,” a KFS spokesman said. 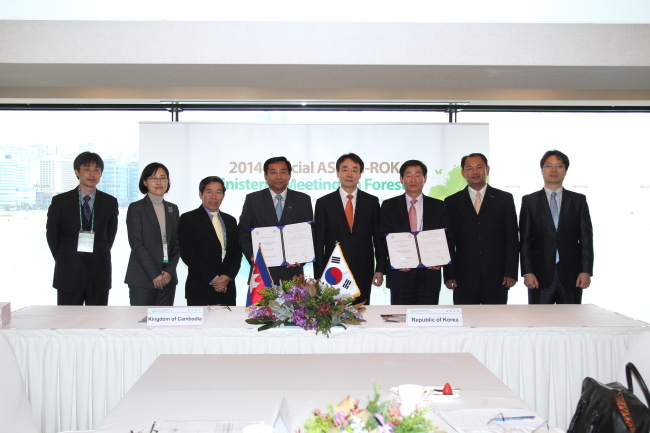 The agreement was reached during the Korea-ASEAN special ministerial meeting on forestry held in Busan. On the same day, the forest agency also inked an MOU with Myanmar on investing in afforestation and strengthening cooperation on climate change. “Myanmar has a vast forest area, measuring about five times that of Korea’s. The country is deemed to have bright prospect for future forestry investments,” the spokesman explained. On the sidelines of the ministerial meeting, the KFS held a Korea-Laos forestation cooperation committee aimed at partnership in forest research and investments. The Korean forest agency has been teaming up with dozens of countries across the globe, including Indonesia, Brazil, China Uzbekistan and Russia. Recently, it held the first Korea-Algeria committee to discuss the restoration of forests and parks in the African country. The agency’s overseas efforts have focused on African countries lately. In June, the KFS signed the Cooperation for Forest Restoration and Sustainability with the U.N. Food and Agriculture Organization to counter Africa’s desertification. The KFS stressed that deforestation and degradation issues are now transcending borders, adding that Korea still has a lot to do. “Sharing Korea’s forestation efforts and policies with other countries in the region has made a significant contribution to greening the earth and creating jobs,” KFS Minister Shin Won-sop said in his opening speech at the ministerial meeting.